The Pure Path gives you honest feedback on your golf swing and helps eliminate slices and hooks to hit longer and straighter. Learn the perfect golf swing. Take the practice range anywhere and never run out of golf balls. Hit with any wood, iron or wedge. 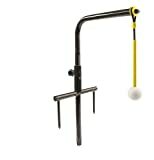 SKLZ Putt Gate Training Aid Innovative two-gate design helps you make more putts. The back gate builds consistent takeaway and square impact. The front gate provides instant feedback on intended ball path. More putts are made by finding the ball's sweet spot and getting your ball on the proper path. With an innovative two-gate design, the Putt Gate helps build the consistent takeaway, square impact, and proper roll that puts your putts in the hole. Train to putt with pro-like touch and accuracy Build a repeatable, square clubface putting stroke Learn to consistently find the ball's sweet spot Reinforces a square takeaway and putter face at impact Create the muscle memory and confidence that make great putters SWEET, SQUARE AND DIALED IN. The Putting Gate's innovative design helps you build the consistent, repeatable pro-like putting stroke that finds the ball's sweet spot and keeps your putter's face square at impact. This keeps your ball on its desired path, meaning you'll hole more putts from all distances. GO BACK FOR A CONSISTENT TAKE WAY, BALL STRIKE. Square ball contact and a true roll start in the takeaway. Set the Putting Gate's back gate to build a consistent, square takeaway and the putter face contact that sets your ball on a true roll. The gate adjusts so you can make it smaller, increasing the challenge and precision of your stroke. GO FRONT TO STAY ON YOUR TARGET LINE. Setting the front gate helps you build the pro-like ball contact, touch and true topspin roll the game's best players use to make putts, even in the highest pressure situations. Like they say, ?drive for show, putt for dough.? And with the Putting Gate, your game on the green will be pure money.